White Chocolate Rose Cupcakes from "My Sweet Kitchen"
White chocolate-studded vanilla cupcakes with Swiss meringue buttercream piped roses from Linda Lomelino's new book, My Sweet Kitchen! I started following Linda’s work well before the thought of creating my own website even entered my head. Her innovative recipes and decadent flavour combinations from her blog, Call me Cupcake, are down right drool-worthy (to say the least), but it was her photography and styling that really turned me from casual follower to super-fan. In her latest book, My Sweet Kitchen, Linda has done it again! With page after page of gorgeous cakes, pastries, and pies, I’ve been wow-ed and inspired to step into my own (sweet) kitchen and get baking. It was baking blog “pioneers” like Linda, Naomi, Aran, and Helene that pushed the limits when it came to photography and really set the bar for newer bloggers, like me. When I started this space, I’d already been baking professionally for years, but I had no idea how to translate my tasty recipes in the real world to an online community on a computer screen. It was these women who deeply inspired me with their stunning photography and helped me understand that, in the blogging world at least, you must first feast with your eyes. Secondly, they showed me that food wasn’t merely for consumption, but that it should tell a story (hello, gorgeous food styling!). Just take a look at their work, and you’ll see what I mean! When I first transitioned from a baker to blogger, I spent a lot of time trying to figure out my camera, shape light, and style my treats in the most appetizing manner. It took a lot of practice (please promise you won’t look too far into the blog achieves, lol). It took a year of serious trial and error to develop my own style, and then another to really hone in on it. My photography is still evolving, and I hope it never stops, but it certainly is a process. Lucky for us, and anyone else still trying to find their own food photography style, Linda has not only packed the pages of My Sweet Kitchen with the most delicious recipes, but she has also included a section on photography and food styling. How awesome is that?!?! Linda helps transform ordinary desserts into beautiful, show-stopping treats, AND THEN shows you how to photograph them! Because really, if it didn’t happen on Instagram, did it really happen at all? If you are already a fan of Linda’s work online (or are just hearing about her now), I promise you will be BLOWN AWAY at how amazing her desserts look in print. Thanks to the gracious folks at Roost Books, I am giving away one copy of her new book! If you want tips and expert advice on how to bake, decorate, and photograph your own creations, be sure to jump down to the bottom of this post to enter! And if you don’t win, be sure to run out and purchase a copy anyway. It really is a great book to add to any cookbook collection, and Linda is just about the sweetest ever. A HUGE thank you to Roost Books for providing the giveaway copy. Be sure to sign up for their mailing list here for more up to date info! Pre-heat oven to 350 degrees. Line a muffin tin with 12 cupcake liners and set aside. In the bowl of an electric mixer, whisk together the flour, sugar, baking powder, and salt. Add the butter and mix until slightly combined and the chunks of butter have worked into the dry mixture - no larger than the size of an almond. In a liquid measuring cup, whisk together the eggs, yogurt, and vanilla. With the mixer on low, stream in the egg mixture. Mix until just barely combined. Stop the mixer and fold the batter until the last of the dry streaks disappear. Fold in the white chocolate. Even distribute the batter between the cupcake liners. Bake for 20 to 23 minutes or until a toothpick inserted into the centre comes out with moist crumbs. Let cool completely on a wire rack before frosting. To ice the cupcakes, I used my go-t0 Swiss Meringue Buttercream. Linda uses a similar icing and tints it with pureed and strained raspberry juice. You may opt to use gel food coloring as I've done so here, or try her delicious berry version! Add in a tablespoon of raspberry puree at a time until desired consistency and flavor is achieved. Fit a piping bag with a small petal tip (I used Wilton 104), and fill halfway with buttercream. For the center of the rose, pipe a tight spiral keeping the tip perpendicular to the top of your cupcake with the narrow end pointed up. Always with the narrow end away from the surface of the cupcake, pipe THREE overlapping petals around the center. Next, continue around with a new layer and pipe FIVE overlapping petals around the center. For the last row of petals, pipe SEVEN to EIGHT petals. I could go on about how to pipe a buttercream rose in more detail, but let's just do ourselves all a favor and go search YouTube instead, hehe. Seriously, I could try to describe how to do it, but there are already so many great resources and videos online that really show you how to do this. Last, but not least, be sure to enter to win a copy of My Sweet Kitchen! Let me tell you about how much I love my kitchen torch. No, it's not because I'm really into fire or anything (I nearly cringe every time I light a match - afraid I'll burn myself), but it sure is fun to play with! Since my broiler and I are more like frienemies and there are certain pastries that require a perfectly toasted topping or caramelized crust, a kitchen torch is essential in the pasty kitchen. From creating the quintessential, crackling sugar crust on a creme brûlée to toasting up the topping on a lemon meringue pie, the kitchen torch performs a multitude of tasks and I am glad I was brave enough to finally take mine out of the box and put it to use. Now that I finally busted out my own torch (seriously - it was gifted to me nearly a decade ago and I just now started using it regularly), I am finding all sorts of coolhot ways to use it. I made some awesome pies last holiday season, a killer lemon meringue layer cake, and I even have a faux s'mores cake that is covered in lightly toasted marshmallowy goodness in my book! Today, I tackled Baked Alaska. But no ordinary Baked Alaska. 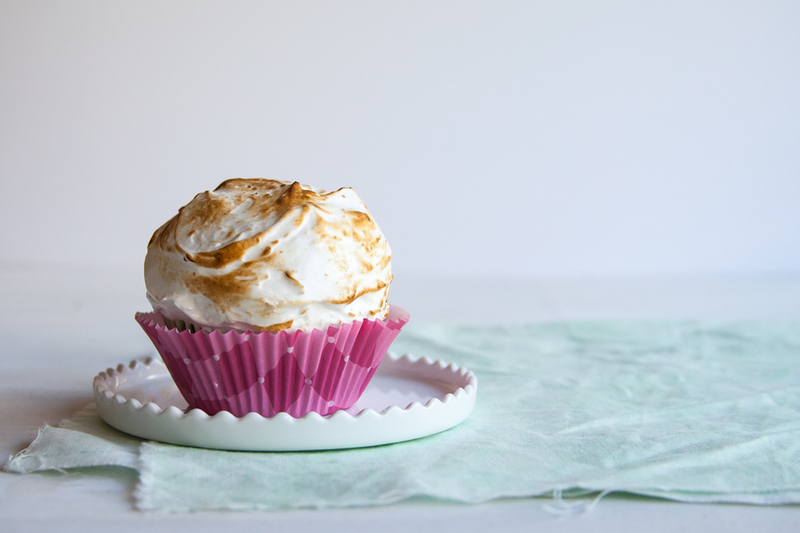 I'm talking mini, individual-serving cakes with a scoop of ice cream and topped with a cloud of meringue before being toasted to perfect Baked Alaska Cupcakes! This modern, mini version of the incendiary classic is perfect for celebrating the end of summer. And what better way to impress your fiends than with a bit of fire and ice? Let me tell you, this is not you grandma's Baked Alaska. They do, however, still have all the best traits of their namesake - cake, ice cream, and toasty meringue - all wrapped up in a personal-sized package. I find that this method to be way easier than baking the meringue. The idea of ice cream in the oven just makes me stressed out. For more tips and tricks, head on over to Brit + Co. and see how I put these bad boys together! Sometimes you just gotta make cupcakes. Am I right, or am I right? And sometimes those cupcakes just need to straight-to-the-point, without extra thrills, and just down-right good. Like most bloggers I'm sure, I am always trying to outdo myself with the next best innovative recipe, an ultimate, over-the-top dessert, or a crazy re-interpratation of a classic. Not today. Today calls for Classic Chocolate Cupcakes and Caramel. My brain had been on over-drive working on recipes for the book. All the holidays and seasons are starting to blend together now (bless Michael's for stocking Christmas decorations 3 months early!). Autumn is my most favorite season, and although I am busy baking away everyday, I didn't want to miss out on fall baking. 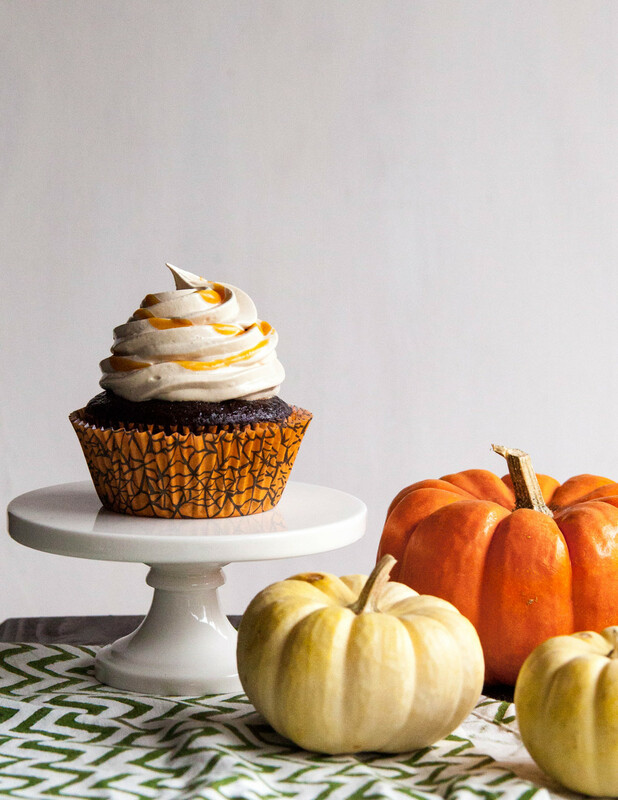 While this recipe is not necessarily festive nor whimsical for Halloween, baked in some cute spidery liners makes these Caramel Chocolate Cupcakes perfectly party-approved. If you were to open the cabinets of my kitchen, then you would quickly figure just how tea-obsessed I really am. I've had a pretty decent collection for some time now. I love going out for tea as much as I enjoy buying it, so the collection seems to grow and grow... When we moved from Cali, my tea was even packed in its own precious box. Some of my habits tend to be borderline nuts, and my tea habit (or tea collecting) might be one of them. My favourite teas are always black teas. I always try greens, whites, and herbals, but they are just not the same. The different flavorings don't come out the same way they do in a black tea. I love a good almond black tea, and I am such a sucker for a nice London Fog. Although it is not necessarily a seasonal tea, I enjoy a spicy Chai the best in the fall. To be honest, the first time I made Chai syrup (to be used in this recipe), I actually didn't have any Chai on hand. However, I did have an almost-full box of cardamom pods. Anyone else have random boxes of whole spices just lying about? No? Just me then ;) Anyways, I decided to make my own chai syrup with just black tea and whole spices infused into a thick, rich simple syrup. Success! The syrup is very strong and pretty bitter - but mix that into some hot water and steamed milk, and YUMMMM. Ever better, mix that into some sweet, silky buttercream - HEAVEN!! Now, we all know that Pumpkin and Cinnamon have been reigning as fall's King and Queen for some time now. There is LITERALLY pumpkin spice EVERYTHING: from candles to cookies, coffee to body lotion, toothpaste to motor oil...okay maybe not quite yet, but you get the idea. For this recipe, I am starring a different orange vegetable and a whole set of spices. These Chai Sweet Potato Cupcakes are extra moist and extremely flavourful. Check out the full recipe over on The Kitchn.